Sunil Dutt was one of the most acclaimed and talented Bollywood actors of all times. He also indulged himself in producing and directing films. Apart from that, Dutt was also involved in politics and joined the Congress (I) party in 1984. He was elected to Parliament, from the constituency of Mumbai North West, for five terms. He also served as Minister for Youth Affairs and Sports, in the Manmohan Singh government (2004-2005). Presently, his seat in Parliament is held by his daughter, Priya Dutt. His son, Sanjay Dutt, is currently a Bollywood star. Sunil Dutt was born as ‘Balraj Dutt’ on 6th June 1930, in the village of Khurd, in Jhelum District. The district, which is now in Pakistan, then formed a part of Punjab in British India. After partition, his family moved to Mandoli, a small village on the bank of river Yamuna, which is now a part of the Yamuna Nagar district of Haryana. A few years later, Dutt moved to Mumbai, to fulfill his long cherished dream of acting. There, he gained admission in Jai Hind College, as an undergraduate, and also took up a job. Sunil Dutt started his career as an announcer on the Hindi Service of Radio Ceylon, the oldest radio station in South Asia. From there, he moved on to films, debuting in the film industry with the movie ‘Railway Platform’, released in 1955. The next year, he was seen in ‘Ek Hi Raasta’. The first big hit came Dutt’s way with ‘Mother India’, the 1957 film in which he co-starred with Nargis, as her short-tempered son. During the shooting of the film, a fire erupted at the sets. It is said that Dutt saved Nargis from the fire and won her love. Dutt was one of the stars reigning over Bollywood in the 1950s and 1960s. He appeared in a number of box-office hits, including ‘Sadhna’ (1958), ‘Sujata’ (1959), ‘Mujhe Jeene Do’ (1963), ‘Khandaan’ (1965) and ‘Padosan’ (1967). During this time, he also did a number of films with B.R. Chopra and ended up delivering hits like ‘Gumraah’ (1963), ‘Waqt’ (1965) and ‘Hamraaz’ (1967). One of the most memorable films of Dutt, as a director and actor, is ‘Yaadein’ (1964), a unique movie in which he was the only actor in the cast. Dutt also indulged in production, with his first film being ‘Man Ka Meet’ (1968), in which he introduced his brother Som Dutt. His next venture came in ‘1971’, when he produced, directed and starred in the big-budget period film ‘Reshma Aur Shera’ (1971). The movie turned out to be a huge failure at the box office. However, this did not deter Dutt and he was seen in a number of successful films, like ‘Pran Jaye Par Vachan Na Jaye’ (1974), ‘Nagin’ (1976), ‘Jaani Dushman’ (1979) and ‘Shaan’ (1980). Dutt also starred in Punjabi religious movies, in the 1970's, including ‘Man Jeete Jag Jeet’ (1973), ‘Dukh Bhanjan Tera Naam’ (1974), and ‘Sat Sri Akal’ (1977). In 1981, he appeared in ‘Rocky’ (1981), the movie which served as the launching pad of his son, Sanjay Dutt’s career. From ‘Rocky’ onwards, Dutt started appearing as a character actor. Amongst his last films were ‘Parampara’ (1992) and ‘Kshatriya’ (1993). Thereafter, he retired from the film industry, coming again just once, in 2003, in the film ‘Munna Bhai M.B.B.S’, along with his son. 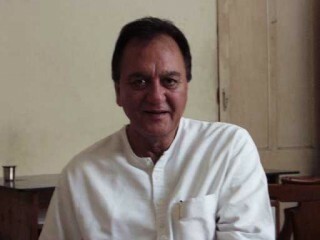 Sunil Dutt joined the Congress (I) party in 1984 and turned his attention completely towards politics in the 1990s. However, the arrest of his son, following Hindu-Muslim clashes in Mumbai, put a brief break on it. After Manmohan Singh government came to power, in 2004, Dutt became the cabinet minister for Youth Affairs and Sports (2004-2005). His death, on 25th May 2005, put an end to his term as a cabinet minister. Thereafter, his seat in Parliament was contested by his daughter, Priya Dutt. She won the seat and is now a Member of Parliament, from North West Mumbai. Sunil Dutt got married to actress Nargis on 11th March 1958, one year after the release of their film ‘Mother India’. The couple had a son the following year, in 1958, who was named ‘Sanjay Dutt’. Thereafter, they had two daughters - Priya Dutt and Namrata Dutt (Anju). While Namrata married Rajendra Kumar's son Kumar Gaurav, Priya is married to Owen Roncon, partner in Oranjuice Entertainment, a music promotion company. Dutt lost his wife Nargis, to pancreatic cancer, in 1981. After the death of Nargis, he set up a foundation in memory of his wife. The foundation is indulged in cure of cancer patients. During his life, Dutt also sponsored the India Project, a Nobel Peace Prize-nominated organization similar to Operation Smile. It is involved in the treatment of Indian children with facial deformities. In 1982, he was appointed as the Sheriff of Mumbai, an apolitical titular position. The position was bestowed on him by Maharashtra government, for the period of one year. 2003 - Munna Bhai M.B.B.S. View the full website biography of Sunil Dutt.